Do you know of a modification so I can have two front auto windows as opposed to just drivers side. 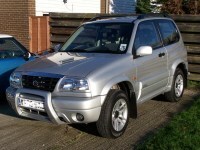 Grand Vitara,54 plate,2000cc,Manual,5 Door,Air Con,4WD. I thought most GVs had electric windows all round? Never known one with just the driver side window. wouldn't be too hard to get parts from another GV to fit them all though. I think he might be meaning, when you press the button for about a second it automatically goes all the way down, without having to hold it all the time. 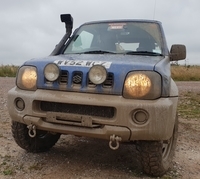 Jimny's also have it, but there has to be a way, i'd say.. I believe this is governed by the switch internal electronics. When the switch is held down for a pre-set time it will continue to lower the window until it mechanically stops/runs out of travel. I assume the current increase then switches the power off. This would be very difficult to replicate for the passenger window. If you hold down drivers switch for say two seconds you can then let go and the window will go all the way down on its own. Tomorrow I will swap them over and test. The switch that you see and operate is just cosmetic. I mean I’ve just taken it all apart and the actual switch is soldered to the circuit board. It’s not like your normal car where you unplug a loom from a switch to then plug in another switch to try.